Jesús Galindo-Zaldívar (Chief Officer, Spain), Naresh C. Pant (Deputy Chief Officer, India), Marcelo Leppe (Secretary, Chile) Contributions of Chief Officers of Expert Groups and Action Groups. 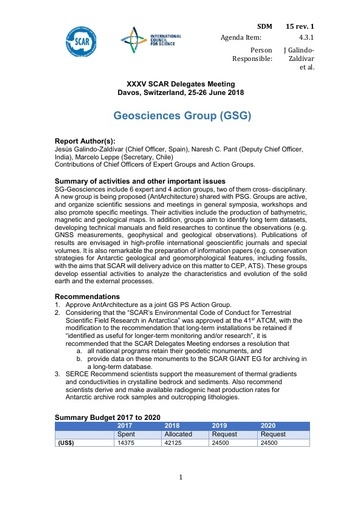 SG-Geosciences include 6 expert and 4 action groups, two of them cross-disciplinary. A new group is being proposed (AntArchitecture) shared with PSG. Groups are active, and organize scientific sessions and meetings in general symposia, workshops and also promote specific meetings. Their activities include the production of bathymetric, magnetic and geological maps. In addition, groups aim to identify long term data sets, developing technical manuals and field researches to continue the observations (e.g.GNSS measurements, geophysical and geological observations). Publications of results are envisaged in high-profile international geoscientific journals and special volumes. It is also remarkable the preparation of information papers (e.g. conservation strategies for Antarctic geological and geomorphological features, including fossils, with the aims that SCAR will delivery advice on this matter to CEP, ATS).These groups develop essential activities to analyze the characteristics and evolution of the solidearth and the external processes. 1. Approve AntArchitecture as a joint GS PS Action Group. 2. Considering that the “SCAR’s Environmental Code of Conduct for Terrestrial Scientific Field Research in Antarctica” was approved at the 41st ATCM, with the modification to the recommendation that long-term installations be retained if “identified as useful for longer-term monitoring and/or research”, it is recommended that the SCAR Delegates Meeting endorses a resolution that (a) all national programs retain their geodetic monuments, and (b) provide data on these monuments to the SCAR GIANT EG for archiving in a long-term database. 3. SERCE Recommend scientistssupport the measurement of thermal gradients and conductivities in crystalline bedrock and sediments. Also recommend scientists derive and make available radiogenic heat production rates for Antarctic archive rock samples and outcropping lithologies.